Myrtle Beach is a romantic oceanfront resort town and a favorite destination for beach weddings as well as traditional chapel weddings. Not only is Myrtle Beach a favorite destination for weddings, it's also a preferred destination for both honeymoons and romantic anniversaries for thousands of couples each year. The romance of the ocean, the seaside setting, and our glorious sandy beaches all contribute to a perfect setting for couples in love. You must obtain a South Carolina marriage license before a wedding ceremony can be performed. A marriage license obtained anywhere in South Carolina is valid here. You can also get a marriage license locally at the county offices in North Myrtle Beach and Conway, which are open Monday through Friday from 8AM to 4PM. You must apply for a marriage license at least one day in advance of your wedding (a 24-hour waiting period is required in the state of South Carolina); and you may return the following day to pick up your license. Both bride and groom must be present to apply for the marriage license. Identification is required, but no blood test or physical examination is required. Below are top wedding resources we hope will help you decide on the perfect wedding ceremony, reception, and romantic honeymoon on the Grand Strand. Let Coastal Weddings and Events make the wedding or event of your dreams come true. As wedding and event planners/coordinators, they can make your desires happen with the least amount of stress possible, so you can enjoy your day. Whether your budget is small or large, they assist each client personally to create an event that reflects your ideas, dreams and personality. Myrtle Beach Brides - Find information on ceremony choices, reception venues, photographers, videographers, live wedding webcasts, and more. Together Forever Wedding Chapel - Your wedding is a special event, and Together Forever's mission is to provide a ceremony that recognizes the uniqueness of each couple and enhances the happiness of your new beginning together. 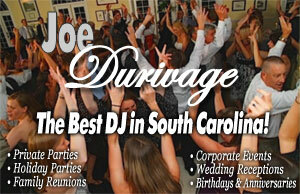 If you get married in Myrtle Beach, chances are you'll hold your reception in Myrtle Beach. Be sure to compare resorts, restaurants, and venues that host wedding receptions locally.